Anchovies: Vive Los Italia Nachos! Anchovies, located precisely in between the good and bad parts of the South End, is like nothing you would expect from the neighborhood– cheap, dive-y, and with a mounted jackelope on the wall. They serve Narragansett tallboys, won’t charge under $20 to your credit card, and don’t even have a website! In our book, all these things earn bonus points. But even more to their favor, the menu full of Italian standards (chicken parm, fettucini alfredo) with the odd Greek salad and Cuban Sandwich boasts something we had never heard of before: Italian nachos. Taking bastardized international food to a whole new level, these nachos consisted of corn chips with beef bolognese, ricotta, some sort of unnamed white cheese (American mozzarella?) and cherry peppers. 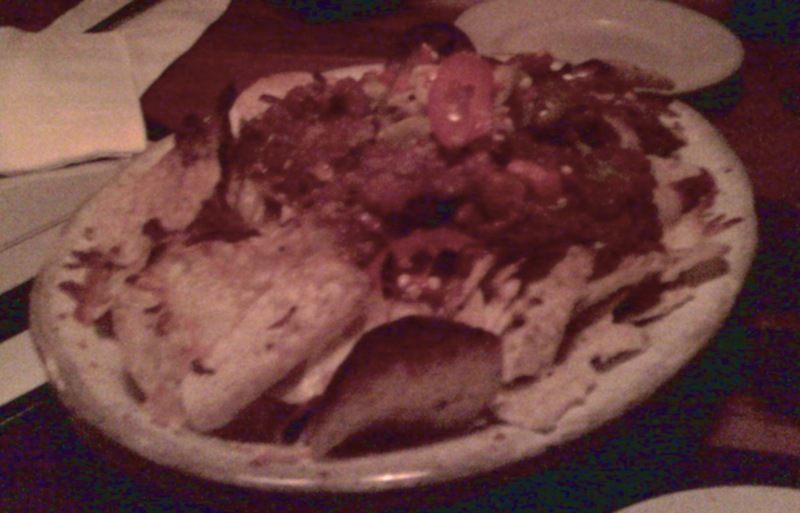 Appearance: (6) Through the dim lights of our booth, it was hard to fully grasp the beauty of these nachos. Bolognese sauce isn’t exactly the pique of culinary artistry, but we liked the varied reds and green provided by the banana peppers. Sadly, the chips were rather burnt…See that wing of darkness in the foreground of the picture? That’s pure carbon. Distribution of Toppings: (6) When these first graced the table we wondered if they had forgotten the ricotta. But then we looked deeper, into the eye of the island (ahem, nachos) and found a heart of cheese (fun fact: “Heart of Cheese” is our favorite Neil Young B-side). It was as if the whole plate was constructed around an initial glob of ricotta. Not a traditional arrangement, and with good reason: we had to use forks to get any ricotta on the chips. There was, however, a heartening (and by “heartening” we mean “heart-stopping”) amount of the other mystery cheese. The bolognese is definitely a sturdy topping, perhaps too sturdy; it was too heavy for many of the chips. Price: (7) At $11, these were a little overpriced for both the quality of ingredients and the rest of the menu. Overall: 26/40 Perhaps we’re suckers for ingenuity, but it’s a rare day when a specialty nachos disappoint us. While the individual flavors were delightful, the plate as a whole lacked the structural integrity necessary to pull at our nacho heart strings. Nothing is more depressing than when you pile up a melee of ingredients onto your chip only to have it crumble, face down, back onto the table. In the future, we’d hope Anchovies moves up a weight grade and gets a sturdier chip (pita chips?). Cut down on the time spent in the oven by about five minutes, and maybe–just maybe–we’ll have a winning specialty nacho.